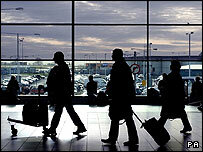 Low-cost airline Ryanair is to begin charging passengers extra for checking in their baggage before flights. The Dublin-based carrier said people with bags and cases would be charged £2.50 (3.50 euros) for every item of luggage checked in from 16 March. Ryanair said it was introducing the charge in an effort to reduce airport handling costs. The airline said passengers carrying only hand luggage would avoid the extra fee and be able to check in online. Europe's biggest no-frills airline said it hoped to encourage more people to travel on its flights with just hand luggage. It said the move would reduce overall ticket prices for passengers not checking in luggage by about 9%. "We have to be more creative as to how we tackle costs," said Ryanair chief executive Michael O'Leary. Reducing airport and handling costs would also save Ryanair more than £20m over the current financial year, the company said.